The cloudmaster is failing. The stormlords are few. Rainlords don’t have the power to bring the essential rain. The land could soon perish and civilisation as it is known is under threat. But from whom? Village boy Shale could be the saviour of the Scarpen lands, but who should he trust? And how does Terelle, with her unusual powers, fit in to the battle he faces? Glenda Larke is a skilful world builder and in this new series, she creates an remarkable desert land where water is treasured and the waterless are the outcasts of society. Born waterless, both Shale and Terelle fight to be more than they were allotted in life, and in doing so, become embroiled in a fight for the very survival of their world. As usual, Larke creates an intriguing cast of characters and a fascinating story that evolves and develops gradually, weaving a spell that envelopes the reader and makes the book almost impossible to put down. My biggest problem is now the long wait for book two, but I have no doubt the wait will be well worth it! Stormlord Rising is possibly the best Book Two of a series I have ever read. To be fair, I have read Book One, but I believe this one even does its own justice to a newcomer to the series. 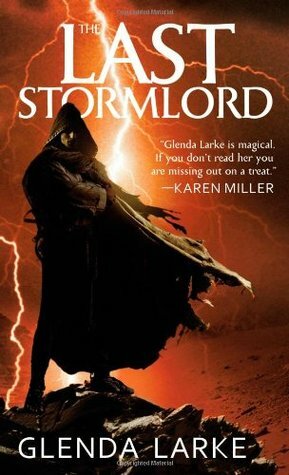 Larke manages to effectively start a new storline with Stormlord Rising that is enhanced by having read The Last Stormlord, but not reliant upon it. With the invasion of Breccia City and Qanatend by the Reduner tribes, led by Sandmaster Davim, which wiped out almost all the rainlords of the Quartern, Jasper Bloodstone – risen from lowly beginnings – is the only remaining stormlord with enough power to bring rain to the region. Supported and manipulated in his flawed powers by the traitorous Taquar Sardonyx, Jasper slowly fights to free himself from the control of others, seeking any way possible to truly command his own destiny. His journey intersects with that of the waterpainter Terelle Grey, who fights her own fate, and the lives of the last remaining rainlords. But Taquar is not the only enemy; Sandmaster Davim is rabid in his hatred of the stormlords, and his heir – the Reduner chief Ravard – has his own agenda as well. Can Jasper possibly fight a war that has so many fronts? This brief synopsis can scarcely do justice to Larke’s complex story. 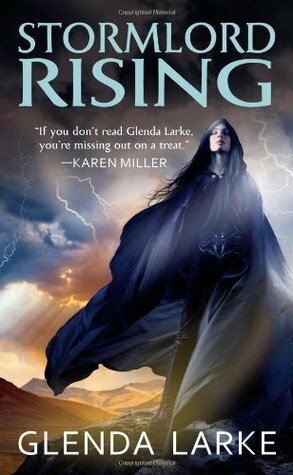 Written so fluidly that the intertwining plot threads weave seamlessly together as the pages progress, Stormlord Rising is a page turner of classic magnitude. The action leaps off the page, supported by characters so well-drawn you fall in love with them, but in the hands of an author not afraid to kill off her darlings, which is a heart-pounding combination! I read this book in the bath, in bed, feeding the baby and in the wee hours. I simply could not put it down. While it’s a huge book, it was so well put together that the pages flew by and I can only hope there’s not too long to wait for Book Three! 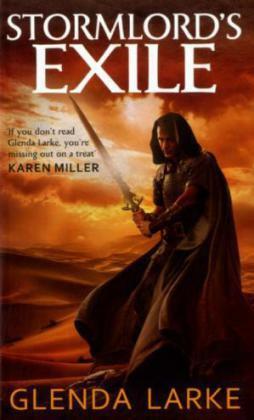 Glenda Larke has to be one of the best writers of fantasy Australia has produced. With a solid backlist of two great trilogies behind her, she has really hammered home her dominance with the Watergivers trilogy. Having set up a world that seems just a little too real with its water problems, but is nonetheless entirely alien, Larke populates it with both magical and mundane characters of wonderful diversity, then throws them into intense conflict. While her books are high fantasy of the fattest “fat fantasy” tradition, they draw you in so completely that the pages simply fly by. It is difficult to review the third novel without spoiling the first two, as such significant character development occurs throughout the series. It’s also worth saying that I highly recommend this series be read in close progression. I wish I’d had the time to reread the first two before devouring the third, as although Larke does well to recap on past events within the narrative, it is a large caste and a broad canvas, so rolling through from beginning to end helps heighten the emotional investment in the story. In Stormlord’s Exile Jasper/Shale is declared Cloudmaster, but his talents are still imperfect and he is stretched thin, even with the help of Terelle’s waterpainting, providing water to the Quartern. He needs more Stormlords, but short of breeding them, where can they come from? Even as Jasper struggles to keep his people alive and watered, there are still plots against him, and he is about to lose Terelle’s support, perhaps forever. In the Red Quarter, in the aftermath of Davim’s death, Ravard seeks to maintain the goal of returning to a time of random rain. But ex-Rainlord Kaneth, with the very able Ryka by his side, have a different vision for the future of the Reduner people, and this leads them, too, into conflict. Can peace, and even prosperity, ever come to the Quartern? One of the most interesting things about this trilogy is the way Larke has diverged from a traditional fantasy setting, with medieval history at its heart. Instead, she has taken us to an arid world where every drop of water is precious, and the people are ruled not by monarchs, but by those with the power to control water. Her commentary on environmental issues in the “real world” are subtle but well drawn, and add even more depth to her storytelling. For lovers of fantasy, I cannot recommend this highly enough. Well worth adding to your “to read” lists!